We’re back with a few horses to watch for the AGOS visitors. Put these runners in your Stable Alert or Stable Mail service. DO A LEGGER (Parx, race 6, 3/12/18) – this longshot was loaded for bear on the far turn but had no where to run. It didn’t get any better when they turned for home as he was stuck behind a wall of horses. It was about 3/8ths of a mile before he got in the clear and when that happened he finished willingly for show. Absolutely horrible trip. DYNASHE (Tampa Bay Downs, race 6, 2/14/18) – Likely winner raced off the pace, made winning move at the top of the stretch but was blocked inside. Lost momentum while winner came clear on the outside. Finished well up the rail for clear 2nd. It was her first start over the Tampa dirt and she should be tough next time out. BOSTON BREEZE (Tampa Bay Downs, race 2, 3/10/18) – maiden ran into a buzzsaw with a $1M Pletcher first time starter and future stakes horse named Ruler Of The Nile. This lightly raced runner finished strong for trainer Chad Stewart and can move forward in his next outing. QUIP (Tampa Bay Downs, race 11, 3/10/18) – great ride from Flo Geroux and an impressive early turn of foot from this rising star on the Kentucky Derby trail. The son of Distorted Humor overcame a tough outside post with a short run into the first turn. Quickly cleared six of the horses to his inside to get into a stalking position behind one of the co-favorites. Showed a lot of grit to out-game that rival in the lane. He is trained by Rodolphe Brisset, only a 10% trainer, but he is a former assistant to Hall of Famer Bill Mott. 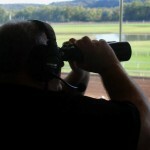 Horses to Watch to put in your Stable Mail or Stable Alert service. Old Up Start – Trainer Steve Asmussen with his go-to-guy Ricardo Santana. He was 6 wide down the backstretch, 5w on the turn, and 4 wide turning for home. He beat right at the wire and you can play him right back. Archival = Joe Bravo in the irons for top trainer David Jacobson. He did a perfect job stalking the pace and got beat at the wire for all the money. This was a very good effort to build and was claimed by Robert Diodoro. Beautiful Buzz – First-time starter by stallion Tuefflesburg. Trained by the Gary Gullo barn and ridden by Angel Arroyo. They teamed up for a very effort solid that will have you chomping at the bit to play him right back. Pony Up = Javier Castello for Todd Pletcher. Taken back at the start and started to move going 5-6 wide on the final turn. He finished up a game second and will be one to keep on your big money radar screen. The winter ovals are opening the doors and we’re ready to follow the horses as they make their next stop. But as we ready for the next oval, we need to keep our eyes open for problem runners who have an excuse. They may not have had a good break, stumbled or blocked down the lane. As handicappers, we are always looking to build our bankroll and there is no better time than now. Keep your eyes peeled and have these runners on your radar. #9 – Sky Promise = Son of Sky Mesa for the Ken McPeek barn. He was adding first-time blinkers and had the services of Robby Albarado. The track was listed as yielding and he seems to enjoy a surface with a little “cut” to it. This day he was tracking from the back and made a strong 4 wide bid to get the show dough. #2 – Like a Haint = Filly by Archarcharch is fresh off two straight claims and was a beaten favorite the last two. She loves CD going 5/6 ITM. She had the services of apprentice Edgar Morales and was rallying strongly on the outside. The leader and eventual winner floated out a little bit near the wire and won by a head. Some would call it race riding and others would dismiss it as a bad streak of luck. – You’ll need to follow her back as she’ll probably head to Turfway Park. #9 -Much Trouble = Miguel Mena in the saddle for Thom Amoss. Shipping in from Indiana Grand and was a beaten favorite last out. He owned a bullet work over the course and looked to fit. He was carried out at the 3/4 and forced to check up sharply at the 1/8th pole. After all this, he still managed a strong place finish. #2 – Ode to the Hunt = Jose Ortiz in the saddle and making a drop in class. This son of Artie Schiller has been off for two months and had two solid efforts making a big closing move. He was pinched back at the break and was fanned out 6-7 wide on the turf trying to make up for lost time. He was widest of all down the lane and grabbed the show dough. #8 – Home Run Maker = Luis Saez in the irons for Jeremiah Englehart and this two-yr-old colt was making his second lifetime start rolling in off a sharp work. Once the gate broke he stumbled badly at the start and rushed up to grab the lead. His rider was forced to alter course around the far turn and all the commotion looked to take a toll on the colt. He still managed an honest 3rd place effort and should be dangerous next out. #1 – Pattin for a Dance = Iggy Puglisi in the saddle and she was making her third start off the layoff move cutting back from a mile to 5 1/2f. – She was 2/3 ITM sprinting and owned a work over the track. She broke tardy and made up tons of ground at a very good price around the turn. Sprinting looks to be a part of her game and should be a factor coming off a 3rd place effort. #3 – Red King = Son of English Channel was coming off a two-month break and had the services of Flavien Prat. Beaten favorite last out, and the Vlad Cerin barn comes back to win 19% on this move. He did an excellent job tracking and made a horse splitting move at the tip of the lane making good headway. He had a powerful late kick and just ran out of real estate. #3 – Painting Corners = Filly from the red-hot barn of Peter Miller (36%) cutting back in distance from 6 1/2f to 5f on the green. Beaten favorite last out and the barn comes back to win 25% getting payback. – Flavien Prat in the saddle and was sent off the odds-on favorite. She was tracking just off the pace and when she tried to make a move at Prat’s urging she lacked room and forced to steady off heels. Once a hole appeared she made a good late surge showing promise for next out. #10 – Pants on Fire = Corey Nakatani in the irons for Richard Baltas. 3-yr-old filly by Sir Percy (GB) is regally bred for the green. She came flying and would have taken flight if she had wings. The way she maneuvered through runners and weaved in and out closing like gangbusters. – Follow her right back. #2 – Solid Wager = Peter Miller is the conditioner and he has been red-hot winning 33%. He was a beaten favorite last out and was left at the post this day. – Victor Espinoza saved ground and swung out gamely making a strong 5 wide move. Everything seemed to fit and he’ll give them fits next time out. The last big weekend is in the books and the countdown to the Breeders’ Cup has officially started. At the time of this post, there are 24 days, 4 hours and 2 minutes. You’ll want to keep tabs on final workouts, shipping schedules and the overall health reports you’ll find in many Thoroughbred publications. The summer is over and the races are in the books. Now is the time to keep on top of your reading and combing over race replays. Best of luck! King of Spades = Son of Street Cry who is 3/5 ITM at Belmont and cutting back from 1 1/4 to 1 1/16. He was dropping in class and had the services of Joel Rosario in the saddle. He was bumped soundly at the start and was pinched back. He got back on task and managed to finish 5th this day. – A cleaner trip has him right in the mix. Enticed = Son of Medaglia d’ Oro coming in off a strong maiden win. Kiaran McLaughlin trainee who ran green but still got the win at first asking. He owned a bullet work coming into the race and a solid work tab keeping all systems ready. He did an excellent job of tracking the pace but was shuffled into the 6 path at the top of the lane. It doesn’t take much to get a two-year-old off task and he put together a solid run finishing 3rd this day. Bricks and Mortar = Chad Brown trainee and a son of Giant’s Causeway. He was 2/2 at Belmont with wins and was a beaten favorite in the G3 Saranac at Saratoga. His late punch has been his calling card and Joel Rosario was in the saddle. – He was in tight after the break and forced to take up and steady. He made a good late run for the show dough and will be heard from next out with a little cleaner start. Minsky Moment = Chad Brown runner with Irad Ortiz in the saddle. This son of Flatter has been heavily bet the last 5 of 6 starts and has yet to run on the turf. His breeding suggests he should relish the sod and Ortiz win 18% on the greensward. He was bottled up around the far turn and was forced to tap on the brakes a few times. He tipped off the rail and made a strong late kick weaving in and out of traffic. Conquest Panthera = Robby Albarado in the saddle for Mark Casse. They were dropping in class and cutting back from 1 mile to 5 1/2f. This son of Kitten’s Joy has faced some tough runners and the sprint this day was coming off his 3rd off the layoff – 17%. He broke slowly from the gate and saved ground the entire trip. Albarado tipped off the rail and made a strong late challenge finishing a very game 4th place. Dona Bruja = Declan Cannon in the irons for Ignacio Correas. She exited the 1 3/16 G1 Beverly D and was a beaten favorite that day. Ever since coming in from Argentina she has looked better with every effort. She is 11/11 ITM on the turf and was turning back to a flat mile. – She kicked going 6 wide and made a strong late run. Maybe a little more ground would be to her liking and if she gets the right distance she will come rolling late in the lane. #7 – Mom’s On Strike = Filly by First Dude and she came flying late last in the $200,000 Pebbles. They made a rider change from Rajiv Maragh to Luis Saez who is winning (16%) on the turf and making her first start in 9 months. She was dropping in class and saw every bit of the track this day getting caught 4 wide on the first turn and 5 wide on the final turn. She closed like a downbound train getting beat by a 1 3/4. She’ll get into gear and rebound greatly off this race. #4 – Sadler’s Joy = Son of Kitten’s Joy was making his first start off the shelf in 49 days for Thom Albertrani. He was exiting the G1 Manhattan and looked to fit like a glove in this race. Javier Castellano was weaving in and out of traffic getting caught wide a few times. Once he shook free and started to roll he was inhaled by the top two down the lane. I’m tossing this one to “race-rust” and we’ll look for good things to come on the next outing. #4 – Pavel = Trainer Doug O’Neill shipped in from California off an impressive 6 1/2f mdn win. This son of Creative Cause may be a good runner to follow as he had to show the connections he has the makings but he may need a little more time. From a maiden score to a G1 across the country may have been too much to ask. Keep your eyes peeled for him next time out as I think he’ll reward his backers coming soon. #3 Duquesne Whistle = Son of Posse from the Linda Rice barn had the services of hot rider Ricardo Santanna. He was making his third off the shelf (25%) and had a bullet work on 6/25 before his victory on 7/1/17 at Belmont. He looked like a good play at (12-1) and he lost his footing at the start and then had to be “snatched” up by the rider to keep off of another runner. Once he got moving he made a solid effort running 4th this day. Vici = Irad Ortiz for Ben Colebrook as they brought a son of War Front to post. He made a flying move going 6f on the sod getting beat at the wire. They dropped him back to 5 1/2f on the weeds and he was 3/3 ITM going this distance. He came into the race with a bullet work at Keeneland and tipped off going four wide to get rolling. The four wide trip became 7 wide and was beaten by a head in a photo by his ultra talented brother Jose. This wasn’t the first Ortiz brother exacta, and it surely won’t be the last. But this guy will come guns blazing next out at the Spa. Free Drop Billy = Robby Albarado in the saddle for Dale Romans. This son of Union Rags was (15-1) on the morning line and was sent off (3-1). – He was an impressive winner at first asking at CD and had a blistering work over the deep Louisville track two works back in 1:00.03 1/32 for the day and distance. The public hammered him at the windows and so did Admiral Jimmy leaving the starting gate. Once he got rolling he went 4 wide chasing down the leader only to settle for the place spot. – Kentucky runners are doing well at Saratoga and you can’t keep Romans off your ticket if you want to cash it right after the race. Nisha = Irad Ortiz in the irons and was shooting for three-in-a-row. He stumbled badly at the start and recovered his action only to slam into Courtmewithcarats. After that little smash-up, he was pinched back and made a stout five wide move to be third. He’ll come back nicely and probably it will be on the Saratoga lawn. Prognostication = Jose Ortiz for Chad Brown and is a good stalker. Ortiz sensed average fractions and made a quick move and jumped into 2nd keeping an eye on the leader. He was a beaten chalk last out and was sent off the odds-on choice today as well. – He couldn’t have looked any better with the talented Ortiz aboard but got leg weary down the lane getting the show dough. Next out he’ll be a major player. Super Franchise = Gabriel Lagunes for Webster Rosello (28%). He was dropping down from condition $10,000 to condition $7,500. – He hopped at the start and was off poorly. Lagunes had him in high gear and put together a late rally that really caught my eye as he finished a solid third. #6 – Grey Queen = Shipping in from Indiana Grand for the Calumet Farm connections. Edgar Paucar was the rider and trainer Jose Fernandez is winning (20%) on the year. – This daughter of More Than Ready was blocked, shuffled back and still came flying very quickly to be a bridesmaid this day. – She gets her picture taken next out with a cleaner trip. #4 – National Defense = Solid gelding shooting for three-in-a-row. 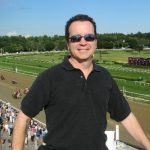 He was 6/8 ITM over the track and made a perfect stalking move under Euclyn Prentice Jr. – He made a ground saving move against the rail and tried to tip off for clear sailing. He was impeded and blocked and was forced to settle for 3rd until a DQ placed him 2nd. I spoke with the riders after he had a meeting with the stewards over this incident and the rider felt he had the best horse by far and lost much of his momentum after being forced to check up off heels. – He’ll be a tough guy next time to the races.